What is a green garden? Is it one that offers habitat and food to native animals? Is it one that produces food for people? Is it one that uses a minimum of water and other resources - or one that creates a shade to cool the house, and is kept damp to help cool the immediate environs? All of these different forms of garden can be a green garden. The impact of plants upon the immediate and wider area in terms of temperature reduction, and possibly increasing rainfall, is currently subject to scientific research. It is an interesting area to follow. Don't remove any vegetation, especially trees, until you are certain that it is necessary to establish the garden that you want. Be aware of the local climate, rainfall and soil type: all these will affect which plants will thrive and what will struggle in your garden. See what thrives in other gardens in your area. Consider the aspect of the house. You can help shade and cool your house with trees - particularly on the Western aspect. Consider where you want (or have) either deciduous or evergreen shade and then the shade patterns will determine what you can grow in the rest of the garden. Reduce paved areas to a mimimum. Consider how much water you will have available for your garden. Be creative: consider rain gardens, grey water and, of course, water tanks. The amount of water you have is the next most important factor in determining what you have the capacity to grow. When planting trees locate them carefully and remember that bigger is not always better. Big trees can be expensive to prune and cause a lot of damage if they fall on your house. Be moderate in your use of fertilizers. A layer of mulch or compost is often enough to keep ornamental plants healthy. Use organic fertilizers where you can. Be aware of what plants are considered noxious weeds in your area and keep them out of your garden. Consider whether you can fit in another plant that will provide food or shelter for a native animal, bird or insect - or you. Also consider whether you can locate a bird bath, being conscious of the saftey risks for young children and water and for birds and predators, for birds to bathe in and drink from when the weather gets hot. 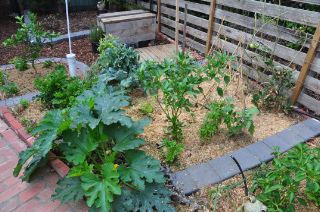 For more information on green gardens see the Sustainable Gardening Australia website which has a wealth of green hints, local pod groups, and online discussion groups. This page was last modified 00:16, 12 July 2009.